I have been a quilter for a long time. I learned at 8 years old while playing with my mother's scraps. My son Vincent has learned at my feet too and finished his first quilt this summer. He picked out the pattern and the fabric himself. I cut the pieces, but he did all the sewing. 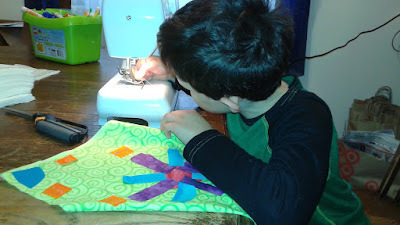 Then he got to quilt it on Grandma's longarm. 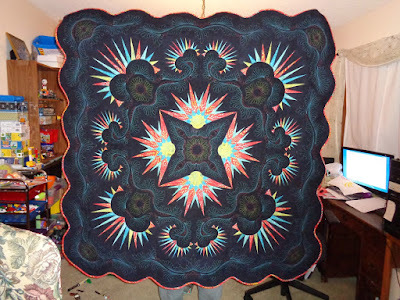 Her comment about this was that he was so much more adventurous and wiling to try that some new quilters she's seen. Well, since mommy enters quilts in shows, then Vincent needed to as well. 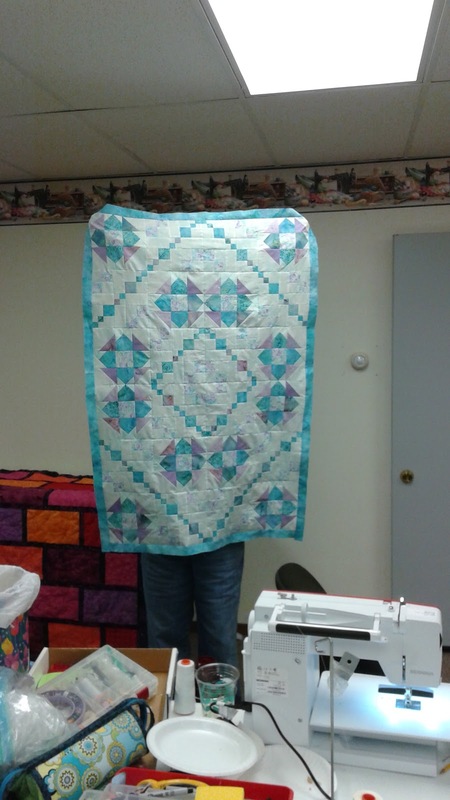 We decided to send his quilt to MQX in Springfield, Illinois last week since I was sending quilts. Little did we know that in addition to getting a ribbon for entering his quilt (an one for the mentor--seriously, how cool is that? ), he received a sewing machine! Thank you to the sponsors! It came in the mail when the quilts were returned and he couldn't be more thrilled. We unboxed it on Saturday and grandma gave Vincent his first lesson on how to use his machine. Sunday he was back at it playing some more. He used some of my scraps with fusible on the back to make a quilt and is working on quilting lines on it. He's so excited. He's bummed that I will be in Houston this week and he won't get to quilt on it until I get home. He of course asked me when I got my first sewing machine. It was when I graduated from college. His comment, "Ha, ha! I got mine at 8!" I am off to International Quilt Festival Houston tomorrow. I hope I sleep tonight. I've been working on a group quilt for the last 5 years and we took a ribbon! I can't wait for awards Tuesday evening as we will all be in attendance (MN, CO, and TX residents!) to accept our award together. It promises to be a memorable evening! Come back all this week to see the events unfolding in Houston! As a lot of show quilts use 2 layers of batting and I do a lot of show quilts, I wondered what would happen with different double layered batts. I've done two layers of wool. The combination has great puff, it's flexible and easy to put through my machine, BUT what else could I do? 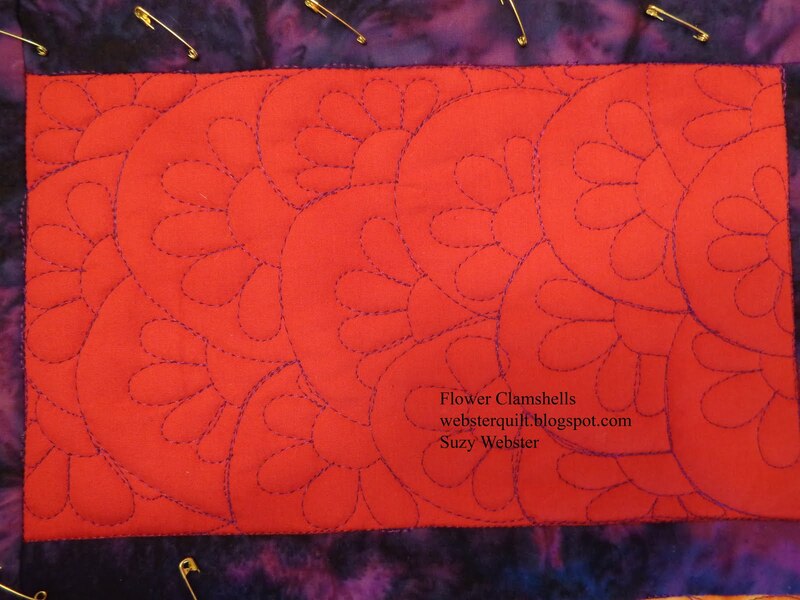 Here are three of my quilts in my Flower in a Pot Quilt Along (patterns available in the tab at the top of my blog). The first has two layers of wool. The quilt is very flexible and drapes well. The feathers have a nice puff to them, the most of anything I tried. It is definitely lighter in weight than the other two samples. The next quilt has two layers of Hobbs Cotton-Wool Batting. I love that the cotton-wool has the stability of cotton with a little puff of wool. This quilt is the stiffest of the three samples I made. It does give the feathers a little puff. and it definitely keeps it's "squareness" and shape which is something that would be good for show quilts. The last sample has two layers of Hobbs Tuscany Silk Batting. The Tuscany Silk is 90% silk, 10% polyester. It's soft and flexible like the wool and has a little more puff than the two layers of Cotton-Wool. I'm not sure why this is, but my husband the non-quilting engineer agrees whole-heartedly with me about the level of puff. It think this batting holds it's shape well like cotton too. The most common combination of double batting is a layer of cotton or 80/20 cotton/poly with a layer of wool on top for puff. I have used this combination in the past and like it too. I think what really keeps me from using double layers of batting in my quilts is the weight it adds when I'm dragging it through the machine. It's more intense. 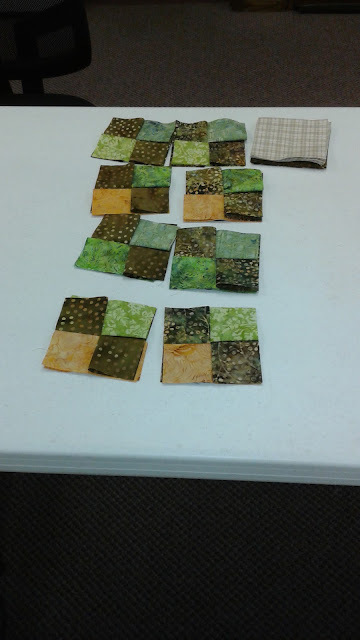 The main lesson learned: Try out different combinations of batts in your small quilts to see what you like. Be sure to mark what's in them on the back so you remember (yes, been there, done that, have no idea what's inside!). Be sure to come back next week to see all sorts of amazing quilts and classes from Houston! Today's design is one that is near and dear to my heart. I developed it for my latest show quilt Kaboom! (see below). I wish I had a close-up of the design to show you, but alas the quilt is in Houston for International Quilt Festival so I can't go snap a picture. 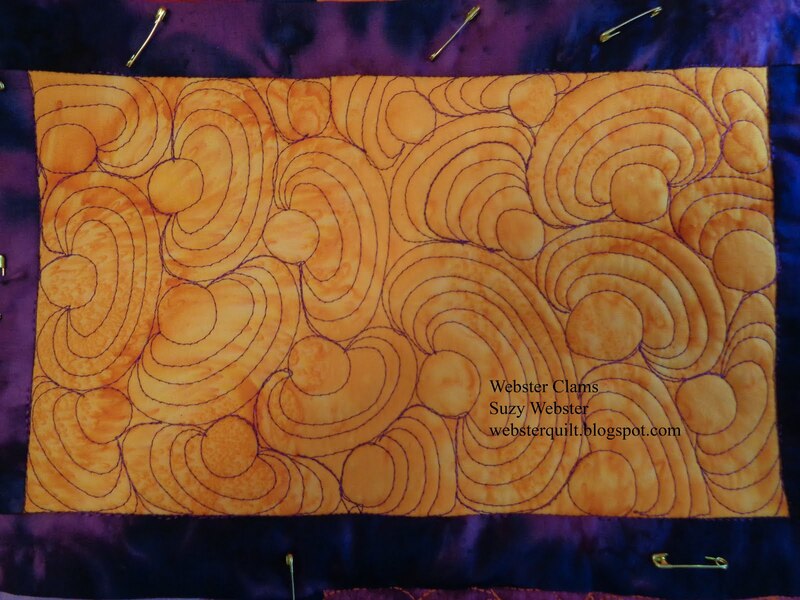 I knew that for this particular quilt I wanted to do a lot of filler designs with circles. After doodling a ton, this design was born. It's now one of my go to designs as it's simple and easy to do and gives a nice texture. You can find the written directions for making Webster Clams here. Start by stitching around your block in the ditch. Then make a circle about 1 inch in diameter. Bounce from one side to the exact opposite side by making a large C arc. Continue to make larger and larger arcs about 1/4 - 1/2 inch apart that start and stop in the same original spots. I usually make 3-5 rings. Even numbers get you back to where you started. Odd numbers get you to the opposite side if that's the direction you need to fill. Travel on the last arc to the spot where you want to start your next circle. Repeat the C arcs going back and forth. Sometimes when you get to the edge of the block you have to travel along your stitch in the ditch line to get where you want to go. 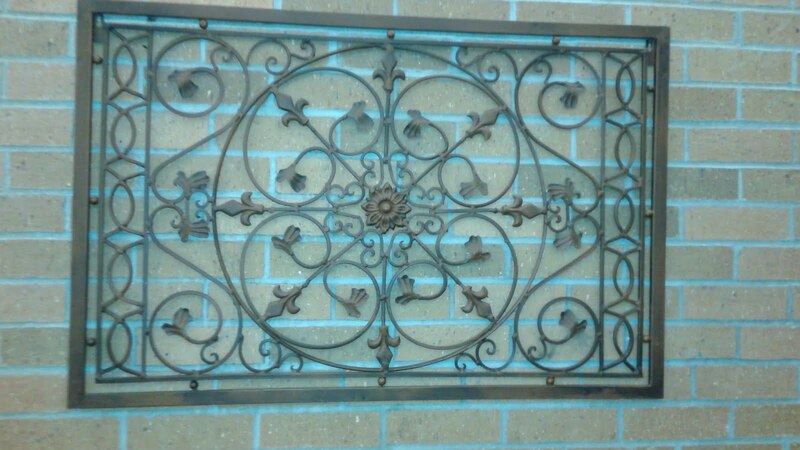 Here are three motifs. I named this design Webster Clams for a couple reasons. First, it's probably my favorite original design I've come up with. Second, when I was designing it I was thinking about those lines on actual clam shells. Keep repeating the circle and arcs until you've filled the desired space. Voila! Webster clams are all done. You can see that some of the arcs are narrower than others depending on the space I had to fill. I love the texture of this design! 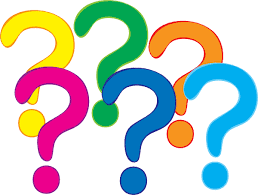 Make sure to come back next week to see posts all about International Quilt Festival Houston! It's sure to be a blast and I'll be posting all about classes, shopping, quilts, and more! Regular Free Motion Friday will return November 11th. Batting Week - How do I choose? If you're anything like me, you look at the wall of batting at your local quilt shop or show and can end up feeling completely overwhelmed. While batting is hidden inside our quilts, it does have a major impact on how a quilt turns out. I've done a comparison of Hobbs battings before which you can read all about here. I've learned even more since I wrote this, so here we go! Cotton - cotton batting is flat, flat, flat. 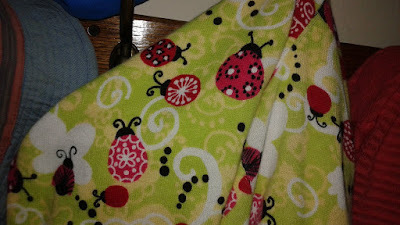 It's fabulous when layering because the fibers of it "stick" to the quilt back and top and make it easy to pin. A recent discovery I've made is that when you're doing a lot of fusible applique a cotton batting is fabulous. It sticks and keeps the applique flat. It doesn't puff out so the fusible isn't distorted which is wonderful. After choosing this type of batting for a small project I realized the value it has in fusible applique quilts and will definitely choose it again for this purpose! Another advantage of cotton is that it doesn't have to be quilted as densely as other choices. I like to quilt feathers and I must admit that I like them to puff, which is why I usually don't choose cotton. But there are some blends available that do have some puff and a lot of cotton. Many show quilters will put two layers of batting in their quilts (first cotton, then wool on top). The cotton helps the quilt keep it's shape and hang nicely. The wool allows for the puff. I do this on small pieces, but have chosen not to on large pieces because it makes the quilt heavy and a bit challenging to drag through my domestic machine even though it has a 10 inch harp space. Okay, so what about cotton blends? Cotton/Poly - My favorite Cotton/Poly Blend is Hobbs 80/20. It is "sticky" like cotton batting, but has a little poly in it making it a tad warmer and giving it a little more puff. It is my batting of choice in my quilts for my children as it is durable and easily washable. You can read more about it here on Hobb's website. My Flower in a Pot #6 was done with one layer of Hobbs 80/20. My Flower in a Pot #2 was done with one layer of Hobbs Tuscany Cotton/Wool. Wool - Hobb's Tuscany Wool is my usual batting of choice for show quilts. I absolutely adore the puff it gives my feathers and motifs. I have used it in garments (mostly vests) and find it equally lovely (though I can only wear these garments in January as they are super warm!) It drapes a little more than cotton. I find it absolutely fabulous. I have used two layers for even more puff. My Flower in a Pot #7 has one layer of Hobb's Tuscany wool. Polyester - I must admit that I am not a polyester girl. Yes, I have used it. However, every time I do I have regretted it. I am sure that people use it quite successfully, but I find it has drawbacks. The biggest one being bearding. Bearding is when the fibers of the batting poke through the top of the quilt and you can see little balls of it forming. Think about what sometimes happens to sweaters called pilling. Same idea. Because of bearding, I do not use polyester batting unless it's an 80/20 cotton to poly blend. 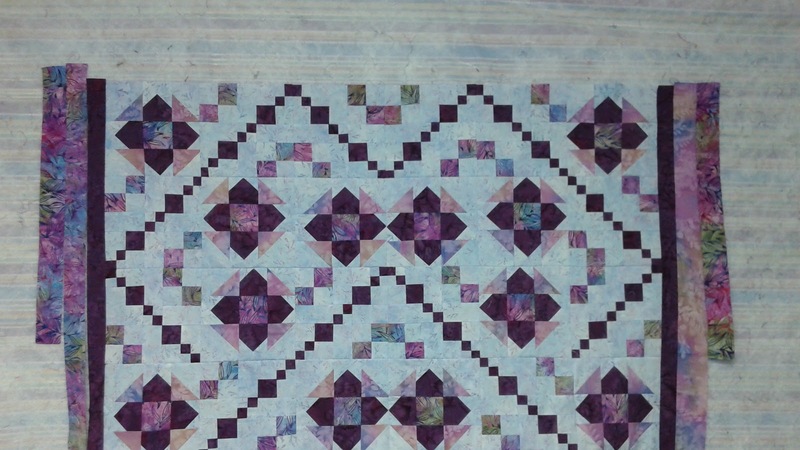 Below is a picture of a quilt I had quilted about 10 years ago. Yes, this quilt has been on my bed and perhaps that's why it has bearded more than a quilt that has been on a wall. It has poly batting of some kind which was chosen by the quilter. No, I'm not mad that she chose it, but it's a bummer that the quilt is now all covered with white balls of poly batting. It's especially noticeable because the quilt has a purple background. This quilt is why I never choose poly. Silk - silk batting is something I started using a year ago as well. I've found Hobbs Tuscany Silk to be a fabulous alternate to cotton batting. The batting is 90% silk and 10% polyester. I find that since the silk is a natural fiber it has the "stickiness" of cotton and lays flat like cotton as well. I enjoy using it in my quilts. If I want my design to really puff up, I would not chose silk as it doesn't have the puff of wool that I like. My Flower in a Pot #1 has one layer of Hobb's Tuscany silk. And there are more choices too, but these are the ones I have personal experience with. One of the things I love about going to a large quilt show is buying small sample squares from Hobbs batting to try out what's new on the market. Come back on Saturday to talk about what two layers of batting is like! I hope that helps you choose and I hope you get to quilt today! I love quilting. I love art too. It's really fun to see what other people put on their walls. 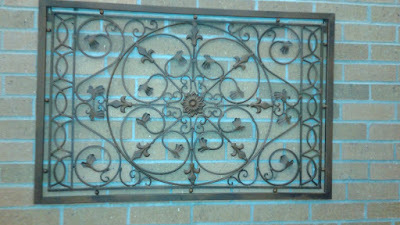 Here's an ironwork design that's on the wall in the building where I go to the Chiropractor. It would make a fabulous applique quilt or quilting pattern. 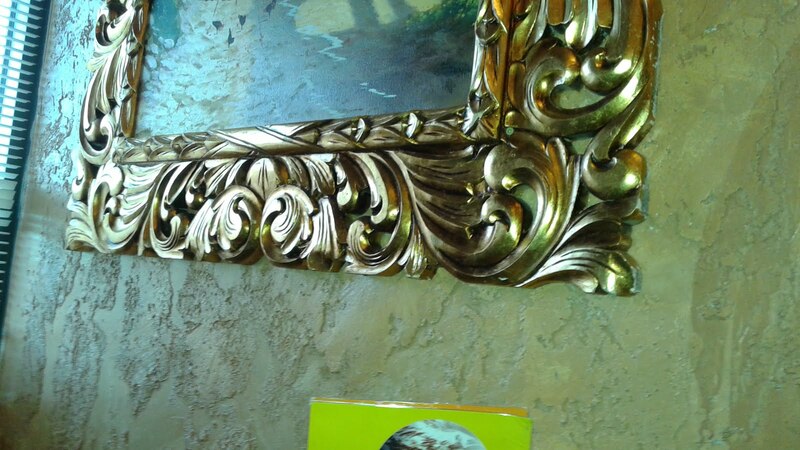 Here's the frame of a painting from my favorite Mexican restaurant. It's great feathers! There are going to be some interesting things on the blog over the next two weeks. This week is going to be batting week. All things batting will be discussed. Next week I head to Houston, Texas for International Quilt Festival and I will be writing blog posts all about it! I'm on my annual quilt retreat with friends at Gruber's Quilt Shop in Waite Park, Minnesota. Four days of quilting only. Okay, okay, yes I did buy a new pair of shoes too. Who knew I needed ankle boots? I'd love to show you what I have been up to, but that's for future blog posts. So instead I will share what my friends have been creating. 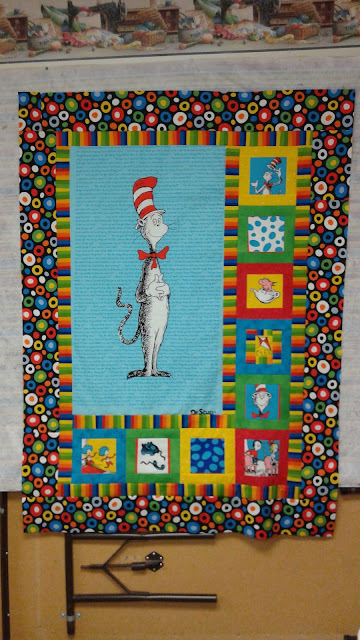 A quilt for a grandkid. I love Dr. Seuss fantic. I haven't fallen for it yet. My friend was trying out borders for her quilt. My mom's baby quilt in the making. The first of two. I hope you get to quilt today! I know I will! If you've been following along on my Brick Wall Free Motion Quilt Along, you have probably noticed that I like to quilt clamshell patterns. The main reason for this is that they're easy to embellish. Today we have Flower Clamshells. Written directions can be found here. Start by stitching in the ditch around the entire square. Then make a small half circle about 3/4 to 1 inch in diameter. Then travel to make a large half circle 1 to 1 1/2 inches from the center circle. Travel back to the center circle and make petals coming out of the center circle. Travel to where you want to start your next center circle Then travel to make your large circle. Go back and make your petals off the inner circle. Here you can see a few already done. 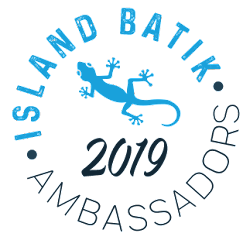 It's October and the Island Batik Ambassadors are celebrating with an event called Pumpkin Fest! We received some gorgeous fall fabrics in our boxes of fabrics and I wouldn't wait to get started. I love making pumpkin quilts. I have quite a number of them. I knew I wanted to make a pumpkin, but what. So I pondered. My mom and I were having a discussion and I finally decided that a pumpkin dressed in a costume was perfect. I decided on a Batman pumpkin because I found the idea of a pumpkin dressed as Batman amusing. Here's a close-up of the stitching. 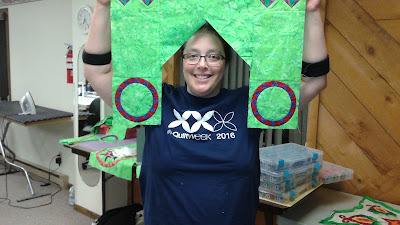 One of my friends suggested quilting a spider web in the background. A great idea for a Halloween quilt. And of course there had to be a spider too! Don't you just love the fabric in the wings? I've been waiting to use it on a Halloween quilt! So much fun. And I like that there are feathers on "Batpumpkins" mask....makes me smile. So much fun! My boys love it and are already arguing about who's wall it's going to go on. Ladybugs. They can definitely be annoying and pesty, but I was looking at the sweater my mom was wearing the other day and I realized they can also be fun to design and doodle on. I mean, seriously, how fun is this sweater? The winner of the Folk Art Quilted Traditions Blog Hop is Lee from Michigan! Enjoy you book and gorgeous Island Batik fabrics! It's been an amazing journey this week seeing what all my lovely friends have made using my book, Folk Art Quilted Traditions. I hope you've enjoyed seeing all their projects as much as I have. It's been an absolute blast to see what they've done. Most of my friends did the Jeweled table runner and they all turned about absolutely beautiful! The Giveaway winner will be announced tomorrow! Now to show you the rest of the process and the quilting. I had fun just playing with this little quilt. 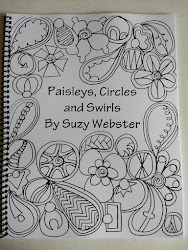 I started by drafting a pattern for the quilting. Next, I stitched in the ditch around the applique pieces and did my curved lines. I decided to use two layers of batting for this quilt. I usually only do this on small quilts because it makes them heavier and harder for me to drag around through my machine. In this case I used the wonderful Hobbs Cotton/Wool batting for the base layer and Heirloom wool for the top layer. Some of these lines were stitched in LARGE basting stitches (center of piecture) compared to the rest of the stitching. These lines were there as registration marks for how far I wanted my feathers to come out. I didn't want to wash this quilt so I didn't want to use anything to mark on the fabric so this was how I worked around that problem. After quilting my feathers I did go back and pull out all the basting stitches. Feathers. Oh, how I LOVE feathers. So fun! Here's a closeup. 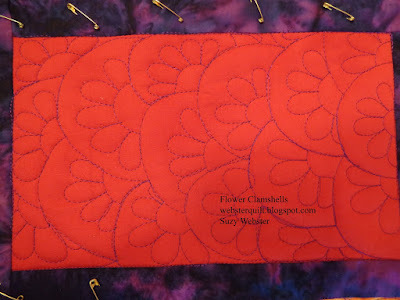 You can see that I used regular feathers, hook feathers, and curl feathers in my stitching. That dark outside blue line you see? It's done with a Frixion pen. I rarely use them, but since it's going to be covered by the binding I did this time. Now I'm starting to add detail. 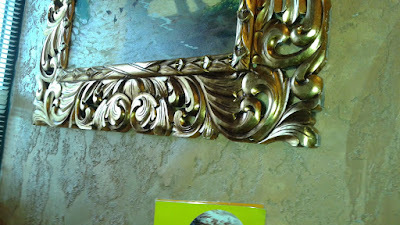 In the corners I added diagonal lines like picture corners in old fashioned photo albums. 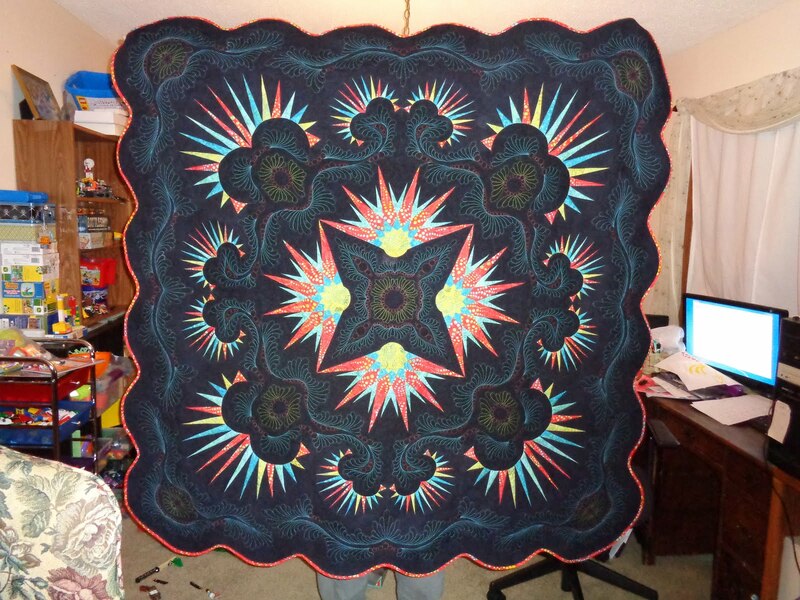 Here's the quilt with it's final fills one. I did pebbles between the feathers and crying clamshells in the middle. A closeup of the Crying Clamshells. I created this design for my Brick Wall Free Motion Quilt Along that I post about every Friday. Adding the binding! I love to use colorful bindings. The final quilt! I sent it off to IQA last month. I can't wait to see it hanging in Houston! 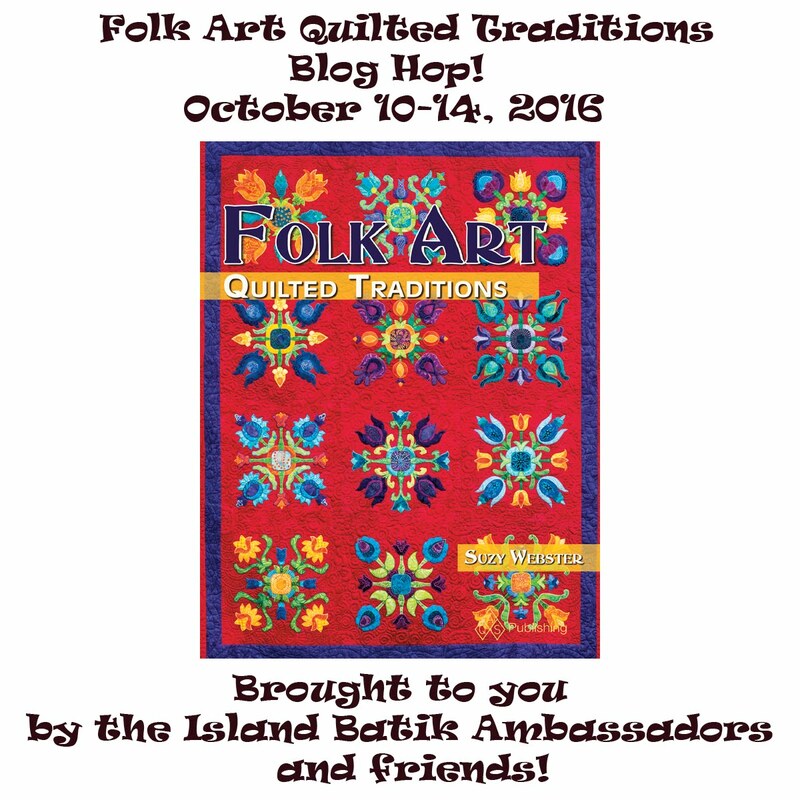 Folk Art Quilted Traditions Blog Hop - Day 5! 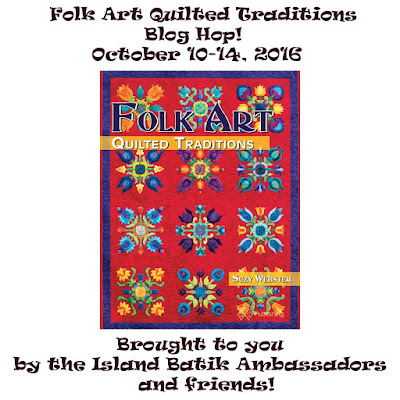 Folk Art Quilted Traditions Blog Hop Day 3!